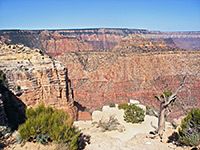 Along with Desert View, Grandview and Yaki, Moran is one of the most visited points on the east rim drive, and offers far reaching views along a wide section of the Grand Canyon, approximately between river miles 87 and 72. 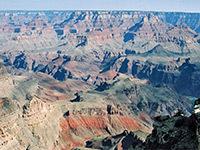 The point is due south of Cape Royal on the North Rim - just 8 miles away in a straight line but 215 miles by road. The promontory is reached by a short spur road and was named after the landscape painter Thomas Moran who came here for the first time in 1873 and helped popularize the canyon, leading eventually to its incorporation as a national monument in 1908 (and a national park in 1919). To the west, Coronado Butte blocks some of the southern cliffs but there are still fine views downriver over a succession of red ridges and ravines, as far as Yaki Point where the Colorado bends back south. The eastern aspect is more restricted, by Zuni Point and ridges below. Directly below Moran Point is Red Canyon, a very colorful tributary and especially so at the lower end where deep red/orange layered rocks are exposed, formed of Hakatai shale. 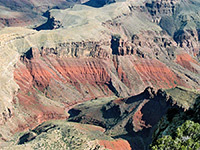 This location is one of many unconformities in the strata of the canyon, where adjacent rocks are separated by long periods of geological time - here the flat, light colored plateau between Red Canyon and the next drainage north (Mineral Canyon) is formed of Bright Angel shale from the Cambrian era, and is over 600 million years younger then the pre-Cambrian Hakatai. The New Hance Trail runs along Red Canyon and meets the Escalante Route opposite Hance Rapids, which are just visible from the rim.